◊ Finding the Jewish Shakespeare, The Life and Legacy of Jacob Gordin, by Beth Kaplan, has been newly released in paperback by Syracuse University Press, Spring 2012. 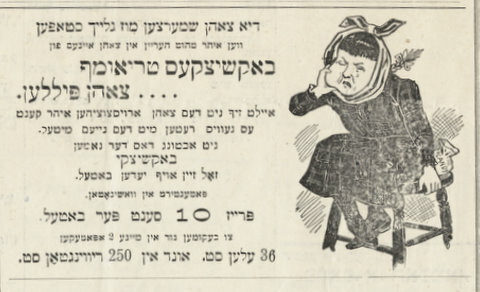 One of the great moments in Yiddish theatre occurred the evening the curtain opened upon actor Jacob Adler in the role of “the Jewish King Lear,” as envisioned by playwright Jacob Gordin in his play of the same name (“Der yiddisher kenig lir”), which premiered on New York’s Lower East Side in 1892. More than a direct translation of Shakespeare, Gordin’s groundbreaking opus was a fresh interpretation of the story of a patriarch with three daughters who are unkind and disloyal to him. In Gordin’s retelling, the hero is David Moisheles, a Russian-Jewish merchant whose daughters abandon their filial love and duty towards him. Adler triumphed in the role, which he would reprise until his death, but the production also made Gordin’s reputation as a bold realist and reformer of the Yiddish theatre, and as someone who, as a rival playwright once observed, wrote “roles, not plays.” To a generation of incipient Americans who had left their parents behind in the shtetls of Europe, the play’s theme of parental abandonment rang with a deep and sad resonance. Ironically, after the play’s first reading, many of the players had prognosticated it would fail because Gordin had removed the cheap effects, cheap laughs and contrived melodrama that were hitherto compulsory elements of the Yiddish stage. “What will I do in that play? Catch flies?” one actor had complained. Further, the tyrannical playwright had insisted that actors give up their time-honoured tradition of adlibbing long flowery speeches to make their parts more meaty. Astonishingly, he wanted them to stick to the script — and the original Yiddish language in which it was written, not the embellished, more elegant “Daytshmerish,” closer to German, that they often preferred. 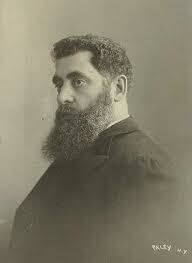 Embracing the trend towards realism set by Chekhov, Ibsen, Tolstoy and others, Gordin (1853 – 1909) was determined to improve the Yiddish theatre as practiced by Abraham Goldfaden, his illustrious contemporary who had established the first Yiddish theatre in Jassy, Romania in 1876 and had penned a series of crowd-pleasing comedies and satires in a fluffy, romantic vein. As Kaplan points out, the Oxford Companion to Literature defines realism as “a movement devoted to the facts of life, especially if they’re gloomy.” To Gordin, theatrical realism was an essential medicine that modern audiences needed to swallow, whether they liked the taste or not. One senses Gordin’s underlying perception of the “low” Jewish masses who need to be educated and elevated, and Cahan’s populist approach by which he gave the people what they wanted and increased his paper’s circulation astronomically in the process. By illuminating such intrinsic ideological and artistic differences, Kaplan helps us understand the Jewish world of more than a century ago and brings a dim milieu to vivid life. A perceptive biographer with a close psychological grasp of her subject, Kaplan examines her great-grandfather’s legacy within the theatrical context of the times. As to the central question as to whether Gordin’s legacy has lasted, the answer is both yes and no. Yes, because Gordin ushered in a golden age of Yiddish theatre with his most popular work, Mirele Efros, which became a “dependable warhorse for legions of actresses, most notably the indomitable Esther Kaminska,” and which is still performed around the world in a multitude of languages. On the other hand, Gordin lived to lament the recidivism by which public taste reverted back to the artless melodrama known as “shund,” and suffered financially when star-managers and producers showed reluctance to take on a new Gordin work, “which brought with it the burden of controversial issues, large casts, and the wrath of the Forward and the Daily Page.” Although upon his death his portrait appeared in every Yiddish theatre and he was honoured in lugubrious speeches as a shining patriarch of the Yiddish stage, his works quickly fell out of fashion, and most remain obscure today.